The Tignes Chalet Company Blog - Chalet Accommodation Tignes: Upcoming Events and Activities in Tignes! With there only being a few days left for skiers to take advantage of the Tignes glacier, many of you will be wondering what to do to fill your days while here in Tignes. If this is you then fear not, here is a guide detailing some of the best activities and upcoming events in Tignes in the month of August. 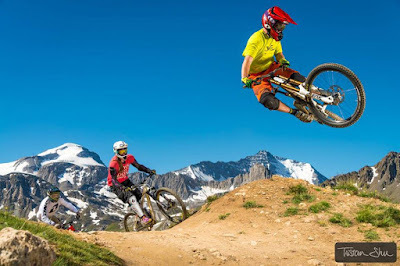 If taking it easy and meandering about town is your kind of thing, Tignes is holding various fairs in Le Lac center in the first few weeks of August. These include a clairvoyance and wellbeing fair from 05th-09th of August, a children’s fair also on the 09th of August and a French wine fair from 11th – 15th of August. Another fair expected to be popular with those in Tignes is the lac Fair. Held on the 14th of August it has promised XXL fireworks. If you want a bit more excitement but not necessarily wish to take part in an activity to achieve this; the Flyboard show happening on the 10th of August may be just for you. 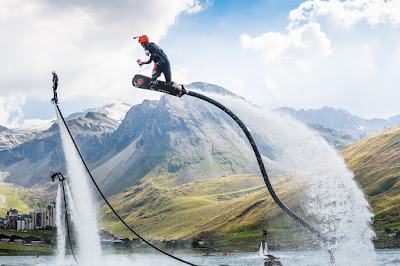 For those of you unfamiliar with this concept, Flyboarding propels individuals into the air using only the sheer force of propulsion from the water. The show is here for one day only performing at 3.30pm and 4.30pm and is one not to be missed. Head down to Tignes Lake to enjoy all the show has to offer and for the best spot, position yourself behind Le Lagon. Enjoy cycling, enjoy watching the Tour De France? Well the Tour De L’Avenir, a cycling race created by and still supported by the Tour De France is heading to Tignes. For its 53rd edition, the Tour de L'Avenir is stopping in Tignes on August 25th 2016, after passing through the Cormet de Roselan, Bourg-Saint-Maurice and Villaroger so why not go and cheer them on. If this is still not enough excitement for you, don’t worry. Tignes can one hundred percent be all about action and adventure. If staying in Tignes one or more nights, you will be entitled to a Sportignes card offered by your accommodation provider. This will give you free access to more than 26 activities nestled in the Tignes District. This includes activities such as the crazy airbag, mountain biking, hiking, archery, paddle boarding, blob jump and water slide into the lake. For those of you still missing the snow, pedestrians can access the glacier via the cable car until the 12th of August and after that via the funicular until the 28th. For up to date daily activities click here.